Over the last few weeks on Rhizo14, I have been troubled with the either/or nature of some of our weekly tasks. We could argue about whether or not that was intended but at least some of the students have perceived concepts as being presented in opposition to each other: Cheating as Learning , Enforcing Independence, Is Books Making Us Stupid? More and more I kept thinking about dualities (more of that later), and it reminded me of a heated discussion on CCK08 about networks and groups. The discussion itself has disappeared from the web, but I can find a snippet of it in an xtranormal video that I made in 2009. The scenario it presents is a conversation between Stephen Downes and Si Si Kate who is a composite character with words taken from the forum and blog postings of Stephen Downes and CCK08 participants. Maybe here on rhizo14, it’s the relationship of apparently opposite things like trees and rhizomes, books and the participatory web that’s of concern. You can jump to the conversation by clicking http://youtu.be/uilkFoe4hQo?t=3m50s or watch the video here. 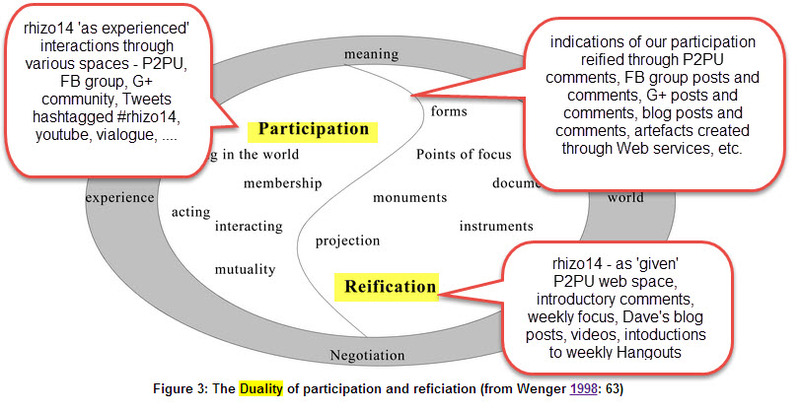 A duality that has been nagging away at me is the duality of participation and reification identified by Wenger in his work on Communities of Practice. I think it is particularly relevant to our experience on rhizo14, and this is an occasion when we need some theory to help us make sense of our practice when dichotomies just don’t work. Reification is a horrible word, but we grappled with one reification of knowledge last week, the book, and it turned out that the villain of the piece still has a place in some hearts. I took the diagram from Hildreth and Kimble, and annotated it with my idea of some the places we have been participating, and some of the ways have been reifying on rhizo14. It’s pretty obvious to think of the reifications that structure the course – we all look for the next week’s task on P2PU. A by-product of online participation is that it makes concrete the to and fro of conversation. We might re-read a thread in the FB group whereas if we were having an oral conversation, we would not be rewinding. An example that springs to mind is my own product for Week 4. I recorded a video (hoping it would be less book-like), published it on youtube, then my blog and encouraged rhizo14ers to post comments on the blog. Then Terry Elliott, put my video into Vialogue, and people have come to comment there. I am thrilled and have a real sense of engagement in the conversations at my blog and on Vialogue. The duality of participation and reification really helps me to make sense of what has happened. The question was the video more participatory than, say, a (reified) text blog post? just doesn’t make sense. Everything was reified, my speaking (as a video), the blog post and comments, the conversation at Vialogue. There was participation in everything but my original recording. What can shed light is thinking about the mutuality between the participation and the reified objects.